The Pennsylvania Turnpike used these two tunnels from 1938 to 1968. 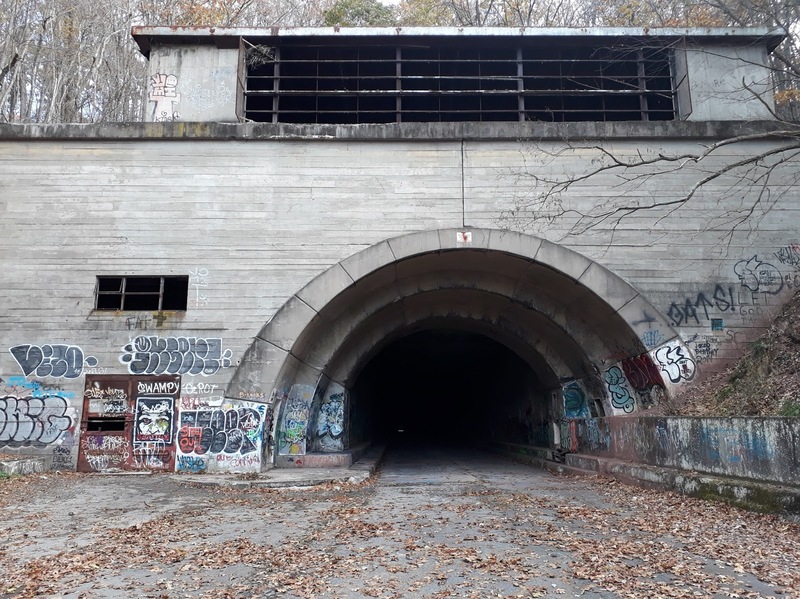 But it was only wide enough for single lane traffic and when it came time to expand the highway, a major re-routing took place leaving the old tunnels abandoned. There has been a movement afoot to turn the old highway and tunnels into a bike path, but they haven't made much progress. In fact, despite what we had read on the internet, we arrived to find out that we aren't even allowed in the tunnels now due to "liability". Seriously? Damned lawyers have sure ruined a lot of things. Now that I read that sign again, I'm not sure. It's possible that we were in fact allowed to use the roadway through the tunnels. Why do they make it so confusing? What's the "upper areas"? Anyhow, we hopped on the bicycles and rode about a mile and a half to the tunnel entrance. At the start of the path. Kevin, riding towards the entrance. Tons of graffiti. But it was still kind of neat. We wandered a few feet into the tunnel up to the point where somebody had recently spray painted "Turn Around Now" in bright fluorescent paint on the old roadway. Disappointed at not being able to ride on through, we turned around. We drove through Cumberland, Maryland. I had looked up another state forest boondocking spot, this time in Maryland. There is a funny narrow strip of Maryland that sits above West Virgina and below Pennsylvania. And in that strip of land sits Savage River State Forest. Their website advertised actual campsites that had "self registration", but there was no fee mentioned anywhere that I could find. Heading in to Savage River State Forest. We got there and sure enough, there was a self registration system. But, all of the sites in the forest were now at $10 USD ($13.10 CAD) per night. Not bad, but not what we were expecting. I think this is a fairly recent change. Anyhow, we put ten bucks in the envelope and picked a nice site. Nobody else around. Checked for a Verizon cell signal... and nothing! That's okay, we can do without internet for a night. Quiet as can be. We can hear the river, but nothing else. Went for a walk down the road to a pedestrian bridge we had seen over the Savage River. Not much to see, but at least we stretched our legs. Walking back to Sherman, we heard a strange noise. Then it got louder, and louder, until we looked at each other and said "is that a train"?! Sure enough, we are about a half a mile from an uphill railway track and boy do those engines have to work hard to get up there. Hopefully there won't be too many through the night! Turns out, we didn't hear a single train. We've changed our plans a little. We were originally going to go due west to Marietta, Ohio but now we are going to go south into West Virginia because we want to see the New River Gorge and go for a hike. Marietta will have to wait for another time. Yesterday's drive, 84 miles (135 kms). Nice price drop on the Black and Decker Max Pivot lithium vac. This is the one we bought and use in the motorhome. Love it! And on sale in Canada too! Yes, in hindsight I believe you are correct. But at the time, I misunderstood what they were saying, and now I'm mad that they don't make it more clear! There should be no possibility of misunderstanding! By the way, if you smell anything unusual, West Virginia is paper mill country, and those railroad tracks are the safest way to get wood chips to and from the mills. WesRock bought out the old Westvaco bleached board mill in Covington, VA (I retired from their research and law depts. here in Charleston, SC.). We know all about pulp and paper mills and the smell that comes from them! We were actually traveling along in Maryland and I mentioned to Kevin that I thought I smelled a pulp and paper mill and sure enough a few miles down the road there was a huge one. "Turn Around Now" would get my attention. As Kevin mention in his reply to Doug, we really should have just continued on. Oh well, maybe next time. We were really lucky no trains went through during the night and believe it or not out of 7 nights that was the only one that had a train line near it. We spent 2 vacations at Pipe Stem state park in West Virginia and loved it. We hiked the new river gorge. If you read please consider Follow the river by Alexander Thom. It is historical fiction based on fact. Out hiking guide told us about the book. I purchased it at the gift store and loved it. I have written the name of the book on my list so we will keep our eyes open for it. Liability. Glad it doesn´t exist in Mexico or at least not at the level of the U.S.
Really enjoy the pics of fall weather. Please, remember its hunting season, dress accordingly !!!!! Bright !!! It put us to sleep too! And, luckily no trains went through during the night.